From its inception in 2003, our plate division has grown steadily to provide our clients with a first class service. Our products are utilised for a multitude of different applications from customers in the general engineering and profiling sectors through to multinationals in the civil engineering, utilities, plant hire, quarrying and recycling industries throughout the entire UK and Eire. One of our biggest sellers. We keep a large comprehensive stock of road plates which are cut, holed and ready to go 6’x4’ and 8’x4’ are the most popular sizes and come in all thickness from 6mm (¼”) to 50mm (2”). Other sizes can be supplied when required. Plain plates are still a firm favourite but as demand grows, we find ourselves keeping a larger stock of anti-skid plates. These are plates which have been coated with the durable and hard wearing Chinese bauxite covering which acts as an anti-slip/anti-skid surface for use in the more demanding environments. Used widely throughout the scrap and recycling communities. 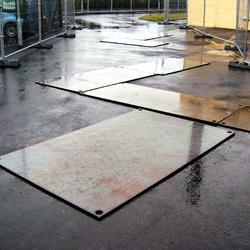 We supply large area steel plates and associated upright posts for the manufacture of these structures. Because every job is different, we ask you to contact us with your specific requirements so we can offer our most suitable stock to cover. For all your enquiries, large or small, contact the office for a prompt and professional service. A maze of some 40 No 2500 x 1250 x 18mm road plates being laid for trench covering. 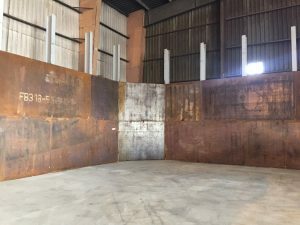 Our plate division recently carried out the supply of these steel posts which were installed prior to having large area steel plates welded on to make internal bays for a recycling company.